AP photographer Gerald Herbert rented a helicopter and shot iconic images of the Macondo blowout rather than waiting for permission from his editors. New Orleans-based AP photographer Gerald Herbert rented a helicopter and shot iconic images of the Macondo blowout without waiting for permission from his editors. 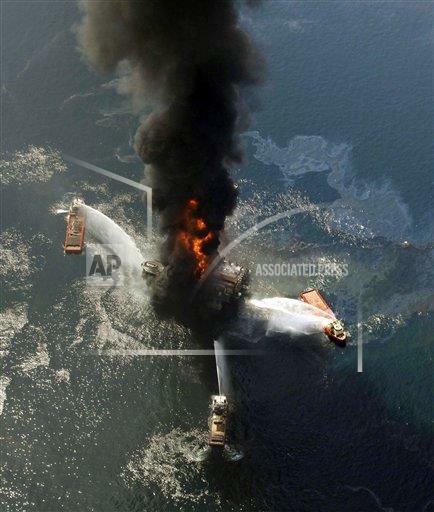 It’s been five years since BP’s Macondo well blew out and began coating Gulf coastlines and sea beds with five million barrels of crude: the largest oil spill in U.S. history. Anniversaries bring on a valedictory mood. We’re inclined to look back and assess outcomes. But only a fool would bask for long in the afterglow of this particular disaster, because Macondo — like Hurricane Katrina, now marking a 10th anniversary — is much more likely a harbinger of catastrophes ahead than something we can put in the rear-view mirror. Five years ago I was living in New Orleans reporting on the BP disaster in Louisiana. Since then I’ve moved back to England, my native turf and, of course, BP’s as well. I now work for ShareAction, a watchdog non-profit that promotes responsible investment. A key strategy: focusing on the money invested in controversial companies like BP, through the trillions of dollars in our pension funds, in charitable foundations, and of course in college endowments. A few weeks ago, ahead of the Macondo anniversary, I attended BP’s annual shareholder meeting here in London. In partnership with major institutional investors from around the world, ShareAction helped muster support for a shareholder resolution demanding that BP pull its head out of the sand and begin to report transparently about the business risks associated with climate change. Thousands of pension-fund holders used our web tool to demand that asset owners vote their shares in favor of the resolution. Amazingly, the resolution prevailed by 98 percent. Our efforts are not limited to BP, of course. Our goal is to draw shareholder attention to carbon polluters of every description, to pressure them to deal more responsibly with the climate change they appear to be causing. We also focus investors on other social issues such as pay inequality and human rights. University endowments — while smaller in the aggregate than the pension funds — are another front in this effort, and college students are proving to be resourceful allies of ShareAction and organizations like ours, particularly when it comes to attracting attention to these issues. And as the BP meeting demonstrated, the carbon polluters are beginning to take notice of the mounting resistance to their harmful — indeed catastrophic — environmental impact. BP had hired platoons of security guards to ride herd on demonstrators outside the conference center chosen for the annual meeting. They reminded me of the waterfront goons-for-hire I had to outrun in 2010 as I scampered across Louisiana beaches to refute BP’s early claim that little if any crude was blackening the sand. It occurred to me that my life had come full-circle since leaving New Orleans. Focusing on pension funds and financial endowments might seem rather less exciting than a reporter’s life in the madcap City That Care Forgot. But it turns out these funds are more concerning than you realized, and also more pivotal politically. It’s just that the financial services industry has done a masterful job of persuading us not to bother our silly heads over the tedious details of what they actually do with our money. A pension fund that willfully ignores the grim truth about carbon pollution’s impact on that future is jeopardizing your retirement nest egg as well as the planet. The challenge I face on a daily basis is persuading people to think of their savings and pensions in a very different way, indeed to recognize that they are a linchpin in any serious effort to avoid the global environmental catastrophe that science foresees if carbon pollution remains unchecked. Research now shows conclusively that much of the world’s known oil reserve needs to stay in the ground, unburned, if we are to avoid that catastrophe. Not only does increasingly risky exploration ruin our environment, it’s also a reckless allocation of shareholder money. Investment is a bet on a foreseeable future. A pension fund that willfully ignores the grim truth about carbon pollution’s impact on that future is jeopardizing your retirement nest egg as well as the planet. Some even suggest that pension funds could face legal challenges from members at some point in the future if they fail to take these risks more seriously. The political problem — as the previous paragraph might seem to suggest — is the time frame in which climate change obliges us to think: Individual life cycles vs. that of the planet as a whole. If your retirement is just around the corner, climate change can seem a long way off. But the horrifying reality is that planetary viability and the investment horizon for securing a comfortable old age are beginning to converge, both being a matter of a decade or two — the blink of an eye, in geological time. And yet even as we rush toward catastrophe, we remain chronically short-sighted. The news media’s 24/7 cycle reinforces that myopia. Journalism just isn’t well suited to covering the issue because climate change is complex and all-encompassing — more akin to a slow bleed than a quick stabbing that leads the evening news and generates clicks on news websites. As Guardian editor Alan Rusbridger said recently on the podcast to accompany that news service’s “Keep It In the Ground” campaign, journalism is essentially built for focusing on short-term drama — which brings me back to the BP disaster. During my New Orleans incarnation, I lived around the corner from the local photographer for the Associated Press. No sooner had he got word of the BP blowout than Gerald Herbert drove to Kenner and from the airport parking lot called his editors hounding them for permission to hire a helicopter and get out to the site of the unfolding disaster. As I understood it, they were still mulling it over when he said to hell with waiting for approval, hired the chopper with his credit card, swept out to the Macondo site and got the pictures of the rig belching fire that made the covers of newspapers and magazines around the world for months. Herbert understood the essence of public engagement. No longer could the oil industry claim that taking more and more risks to get deeper and deeper oil out of the ground was in their shareholders’ best interest. That one image crystallized decades of rising concern about the oil industry’s governance. Dogged reporting further exposed the industry to harsh light that even the most pro-oil shareholders could not ignore. It was a quick jolt to the world’s conscience, a moment of satori; the penny had finally dropped. Another such moment was the unintentionally asinine comment from Tony Hayward, then still BP’s chief executive, musing aloud on when he might “get his life back,” after a disaster that had killed 11 rig crewmen and jeopardized the health and incomes of millions more Gulf residents. Divestment campaigners like writer and naturalist Bill McKibben argue that the best strategy for getting companies like BP to change their ways is to withdraw our money from them completely. Sure, that’s one approach to the crisis at hand — and a powerful one. I have no doubt our resolution would have failed were not BP and its major shareholders wary of the divestment lobby’s growing influence. But it’s not the only strategy that makes sense to me — indeed, it could be counterproductive if divestment simply severs the connection between corporate boards and shareholders of conscience. The reality is that engaged shareholders can push corporate boards in the right direction — forcing the likes of BP to finance the transition to renewable fuels more aggressively, for example. The real question, now, is whether our engagement with BP and others of its ilk is robust enough. Can we steer them away from the financial and environmental consequences of ignoring climate change? It will require grit and determination, and a genuine sense of urgency, to deliver on our potential. But thinking about what Katrina did to New Orleans, and having seen first-hand what the Macondo disaster did to Louisiana, the alternative on a global scale is too horrible not to take very, very seriously. Former Lens staff writer Matt Davis won the Press Club of New Orleans’ investigative reporting award in 2012 for exposing corruption at the city jail. He is now director of communications and public engagement for ShareAction.org in London.